There are many ways to stay connected with your fellow alumni and informed about happenings at Drew. Whether through social media, enewsletters or Drew Magazine, you’re never far away from The Forest. Stay in touch with your classmates through social media channels managed by Drew alumni. Don’t see your class listed? Contact alumni@drew.edu to get yours added. Don’t see your region listed? Contact alumni@drew.edu to get yours added. 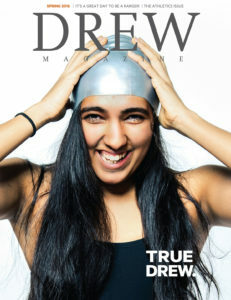 All alumni, parents and friends of the University receive a free subscription to Drew Magazine, which features news from campus, stories about students, faculty and alumni and Classnotes. Drew produces several enewsletters to help keep you informed about events, news and people at the University. To ensure continued receipt of appropriate newsletters, please make sure to update your information. If you have previously opted out of emails and would like to receive them again, please let us know by contacting the Office of Alumni and Parent Relations. The Forest (the enewsletter formerly known as Gateway Messenger) is sent monthly to alumni and friends of College of Liberal Arts and the Caspersen School of Graduate Studies. Theo Spirit is sent monthly to alumni and friends of the Drew Theological School. GDR News is sent once a semester to alumni and friends of the Graduate Division of Religion. Ranger Report is sent once a semester to athlete-alumni and friends of the Drew Rangers. Drew This Week is sent weekly to the on-campus community and others who wish to keep up with happenings in The Forest. Be sure to keep Drew up to date with your contact info in order to receive Drew Magazine, enewsletters, invitations to events and other offerings. In The Forest, even our buildings have personalities—none more so than our residence halls. Find out which Drew residence hall best fits your personality.